He was born on the 8th day of the 3rd month of the year of the Earth sheep, 1859. The name of the village in which Shardza was born is Da ” in the foothills” of that place. His father, belonged to the clan of Hor, and was called Tashi Ga and, his mother was called Boleg. Shardza Tashi Gyaltsen attained the Rainbow Body in the year of 1935. Tenzin Wangyal recognised that the boy had a very long lasting connection with him over many past lives. So he was very kind to this boy from the beginning and the boy was always very devoted to him. When the child was born, he had blessed him with long life. After the boy became older, he took the refuge vow from Tenzin Wangyal, who prayed that the boy would become beneficial to all sentient beings. Thus he gave the boy, the name Tashi Gyaltsen. When he was young, he kept the vow of refuge and other simple vows very strictly. Everyone praised his manner of keeping the vows. When he was older, the abbot of Yungdrung Ling whose name was Kelzang Nyima Togi Gyaltsen came to Kham. He was invited to Dza Tengchen Gonpa , the boy’s monastery. Many people took their vows from this abbot, and each received a name at the same time. When it came to Shardza, he received the name Tenpa Drudrag from the abbot, who repeated the name three times. All those who were taking the vows burst out laughing loudly. The abbot said that it was a very auspicious sign and that the boy would become a great master. The reincarnation of Tazhig whose name is Shengyal Tenzin came to the Dzakog county upon the invitation of Shardza’s monastery. He was the holder of the Vinaya vows of the Menri lineage. In front of the Abbot, Lopon, witness, interpreter all four whom were high monks, Shardza took the highest and final Vinaya vows. He kept his original name, Tenpa Drudrag, and additionally received the name Drime Nyingpo . From that time onward, he never took any alcohol, never ate meat nor wore the skin of animals and he conducted himself completely according to the Vinaya rules. Altogether he observed 250 vows. The vow of Bodhicitta which he took from Samten Yeshe. At the same time, he received the name Gyalse Zhenpen Norbu. He practiced the two kinds of Bodhicitta: one that is according to the absolute truth and the other according to the relative truth. When he took the vows, he offered 100.000 of butter lamps, flowers, incense and tormas. From then on, he always kept the vows very precisely and paid attention to all details. In the tradition, different texts mention different vows as part of the Bodhicitta vow. Some mention 20 vows, some mention an extended form of 360 vows, some mention a medium form of 108 vows and some 28 vows. These vows can be described as the 4 kinds of Bodhicitta vows, all of which Shardza practiced. In addition he also practiced the 10 perfections. The Tantric Vows: Shardza took the tantric vows from his root master, Tenzin Wangyal. He took the initiation of the Yidam called Walse Ngampa . At the time of the initiation, he was introduced to the nature of mind, the 4 initiations of the yidam and the initiation of Dzogchen called Gyaltab Chilug. In the tantric vow, there are 5 root vows and 25 branch vows for the Kyerim, and 5 root vows and 100 branch vows for the Dzogrim. In Dzogchen, there are 30 vow,. Shardza kept all these vows carefully and clearly. In the Bönpo tradition, all the vows mentioned above are those that can be taken by a person who can take all 3 types of vows, which he did. From another master called Rigdzin Tsewang Dragpa who was also known as Dechen Lingpa, he received the initiation of the peaceful and the wrathful form of the same yidam, Walse Ngampa. He also received the Dzogchen initiation of Rigpai Tselwang , as well as the preliminary and essential teachings of Atri, and many other tantric initiations. Altogether Shardza had 24 teachers, from whom he learned different subjects. Usually people were satisfied after learning from one or two masters. Shardza was special. He continued to seek and learn all the time. In his own country, the tradition of the teaching was mixed up with the new Bön. He was able to see clearly the historical and pure part of the old Bön teachings, and completely left out the new Bön teaching, keeping strictly to the old Yungdrung tradition. In Bön there are 5 high clans or families: 1) Dru 2) Zhu 3) Pa 4) Me 5) Shen . Each one has its own lineage tradition and strict rules, even though they are all still Bönpos. He respected all of these traditions, but he followed the Dru tradition, because this is the lineage holder of Menri. He practiced everything, including tummo, Dzogrim and mantra. Even though he mainly practiced the recitation of mantra, he especially did the practice of Trekchö and Tögal all the time. When Shardza was about 24 years old, one day he felt great disgust for living in this worldly life. So he decided to go stay in solitude completely. The place he went to stay was Yungdrung Lhunpo , which bordered Shardza, his county. When he went there, many auspicious signs appeared, so he decided that it was a suitable place. There he built a small hut, just big enough for him to sit inside. At this place, he completely stopped all external and worldly activities and connections, and internally his mind stopped thinking of plans and desires, including relatives, friends and wealth. Living in solitude, he only had simple food and one set of clothes. In this way he practiced with a rested body, speech and mind. He also carved many blocks for printing books, particularly his collected works, which amount to 13 volumes. Altogether 330 volumes of books were carved in blocks. He always offered flowers, incense, butter lamps, water and mandala on a regular basis. Every tenth day of the month, he made offerings of Ganapuja. Even though he was teaching a lot, he remained in his solitary retreat place. He worked on the preliminary teachings and the history of Sutra, Tantra and Dzogchen. Hence, he compiled them into 2 volumes. His commentaries on the Nine ways of Bön and on Trekchö and Tögel of Dzogchen in particular were compiled into two volumes. He held the lineage of Zhang Zhung Nyengyu teachings. He also wrote many ritual texts for prayers and ganapuja, as well as Chod teachings, sutra and tantra teachings with various subjects in the sutra and their commentaries. All of his work is like a lamp for the old Bön tradition. Later in our time, when people eagerly want to know something about Bön, his works are like a key to the whole tradition. 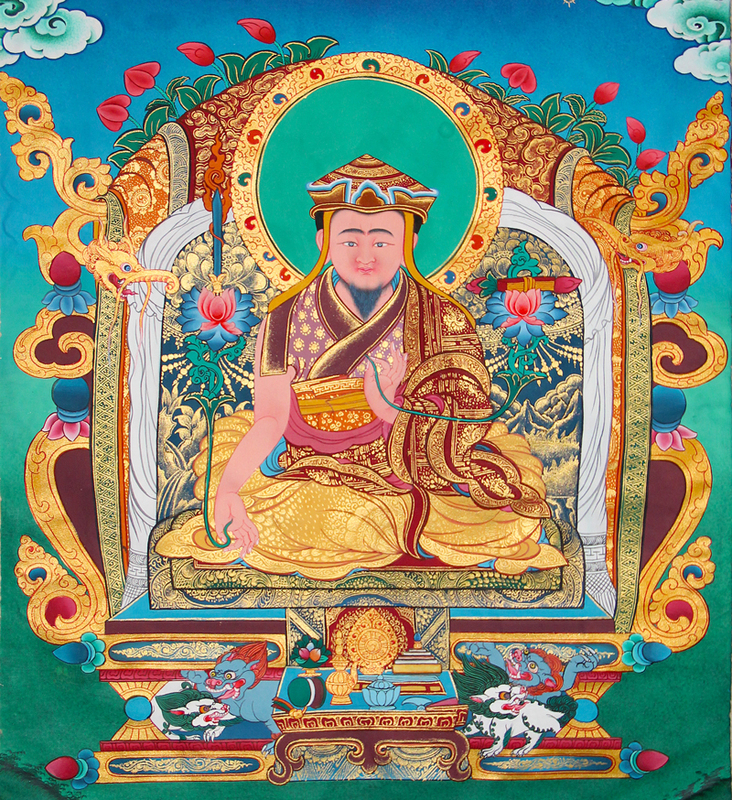 He helped his monastery, Dza Tengchen Gonpa to rebuild. For the exterior he reconstructed the temple, and for the interior, he restored the images. Three images are two stories high-about 18 feet tall. There are many other smaller ones which are one story (about 9 feet) tall. On the outside of these images he made many precious decorations. He always offered flowers, incense, butter lamps, water and mandala on a regular basis. Every tenth day of the month, he made ganapuja offerings. He also carved many blocks for the printing of books, particularly his collected works, which amount to 13 volumes. Altogether 330 volumes of books were carved into blocks. Five huge prayer wheels and several large stupas were also made. All of these things together with the properties offered to him were, in turn offered to his master from time to time. Later, he made his nephew the successor to the meditation centre in Gethang and this nephew took over the teaching responsibility when Shardza was getting old. In all his teaching centres, the vinaya vow was strictly observed, while the meditation practice was Dzogchen. When he was 75, in the year of the waterbird, Shardza changed his manner of teaching. In addition to the more serious topics, he gave more general kinds of teaching to his students, giving them advice. Usually he only had one meal a day, but then he began to accept all offerings regardlessly. He also liked to play with children more, and began behaving very freely, without any consideration of how his worldly manner should be. Some of the students began to see him manifesting as the form of various divinities. Some of his helpers also saw him walking away with his feet above the ground. Some saw him leave his bowl floating in mid air. At night they could not see his body throw any shadow in the light of the lamps. This was noticed very clearly. He said to his disciples, I, the old man Shardzapa, don’t know when I am to pass away. I have been teaching specifically for the past 8 years and I have taught mainly important teachings and I hope that you are not going to waste them. I advise you not to waste any of these teachings you have received but continue to practice until you are stable in your natural state. I think you are all very lucky, because it is very rare to receive these teachings. Since you have received them, you must try to realize yourself. They are very precious, can you understand? When he was 76, in the year of the wood-dog, one of his disciples, Kelzang Yungdrung was praying and practicing in order to bless some medicine. Shardza told this disciple to finish his prayers before the 4th month, because after that they would not meet again. Then on the second day of the 4th month Shardza was presented with the blessed medicine with the prayer complete. He said, “Now I have to go to the empty places.” So he went to the place called Rabzhi Teng to stay. He put up a small tent there. Several of his students followed him and he told them, “The base of all knowledge is faith, devotion and vow. So you must realize this and carefully practice.” In addition, he also gave them much advice. Very often his gazes were straight into space. On the 13th day of the 4th month, he made a ganapuja offering of Tsewang Ba Yulma and he sang many teachings in the form of songs. He then ordered his disciples to sew the tent completely closed, and not to open it for many days. Then he went into the tent and said “good luck” to his students, as well as prayers. Then he sat inside in the posture with 5 characteristics. On the next day, his students saw many rainbows above his tent. Some were big, some were small, some were round, others were straight, horizontal or vertical, all with many colours. Particularly at night white lights like long white scarves shone forth brilliantly, which everyone saw. On the 4th day, there was an earthquake, and there were loud and strange sounds. Also showers of flowers rained down. Between the stitches of the tent many lights with different colors, some with 5 colors, some with only a single color came out like steam. His student, Tsul’trim Wangchug said, “If we leave the body for much longer, everything will disappear and there will be nothing left from the corpse. We should have something as relics for our devotion.” So he opened the tent, and prostrated. The body of Shardza was completely wrapped up with light, and the size had shrunk to that of a one-year-old boy. It was suspended above the mattress at a height equal to the distance between the outstretched finger tip and the elbow of an arm. He went into the tent, and saw the fingernails had come out of the fingers and were scattered on the mattress. When he touched the body, the heart was still warm. He wrapped up the body with a cloth and kept it for 49 days. He then did a puja of the 1000 names of the Buddhas, as well as many ganapujas and other offerings. After, when visitors saw the body and touched it, everyone had many special feelings rising in themselves. All the people saw lights, rainbows and rains of flowers every day. All the local people visited the body and strong devotion arose in all of them and they had great belief in him. His successor, Lodrö Gyatso and his younger brother, Tsultrim Tenzin, saw to it that all of his properties were given as offerings and donations to all monasteries, both Buddhist and Bönpo, particularly to his own monastery, Dza Tengchen Gonpa. They also asked the monasteries to do prayers for many weeks, and gave them properties so that every year they would recite prayers on the anniversary of the manifestation of his rainbow body on the 13th day of the 4th month. They also made a large memorial stupa, with gilded copper, and his body was put inside in the niche of the ball of the stupa. Even much later people still could see the reflection of lights and rainbows and sparks coming from it. Long version of Shardza Tashi Gyaltsen Rinpoche’s bio – extracted and translated by Yongdzin Tenzin Namdak Rinpoche from the biographical account by Sula Kelzang Tenpai Gyaltsen.